Frank G Howes (1916-1989) studied at Gloucester School of Art and the Royal College of Art. ARCA painting and etching and engraving. He worked in the wartime RAF medical services. 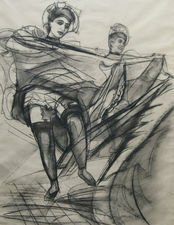 Howes later taught drawing and printmaking at Guildford and Farnham Schools of Art. He was a frequent RA Summer show exhibitor. Howes had solo and shared shows including the Folio Society and works in many private collections.